VIP only welcome party with special musical performances. Info and instructors to be announced shortly. Going away POOL PARTY with DJs & bounce house for kids. 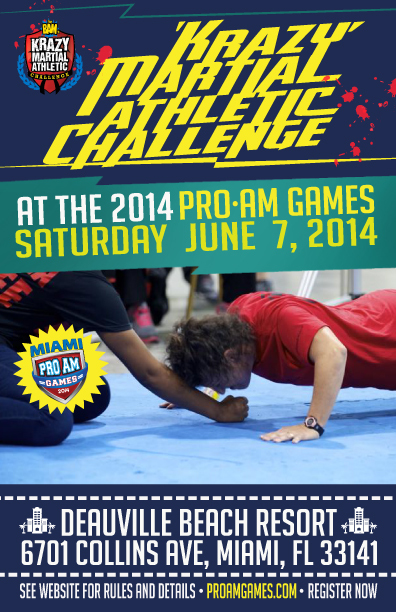 The Miami Pro-Am is a Pro Breaking Tour Challenger Series event. 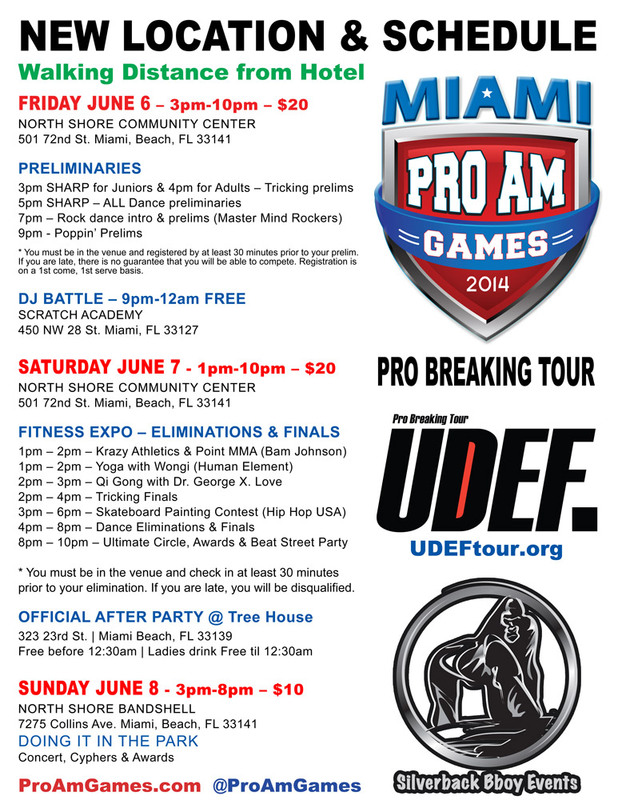 Miami Pro-Am competitors must confirm their registration with UDEF as TOUR COMPETITORS with Cracker Zacks to be eligible to compete in the 4 adult prize money bboy/bgirl events, and to be added to the official registration list for this Pro Breaking Tour Challenger Series competition. 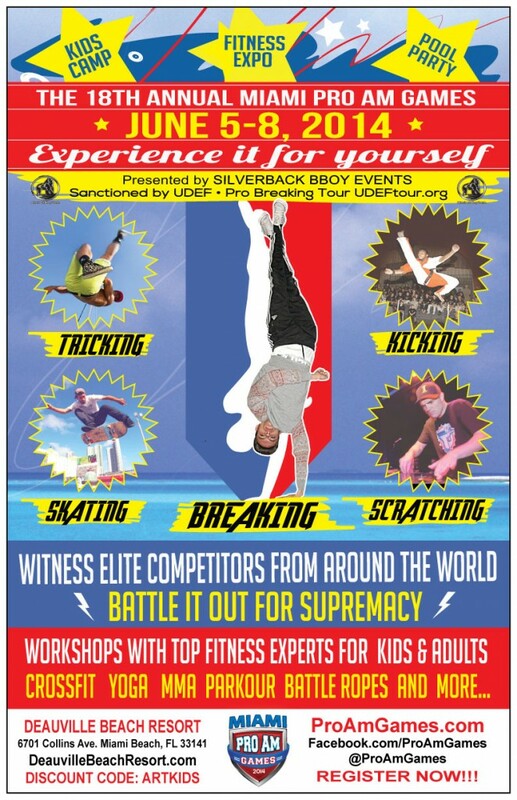 Please Inbox Cracker Zacks the email you used to register online with UDEF, along with your bboy/bgirl name. 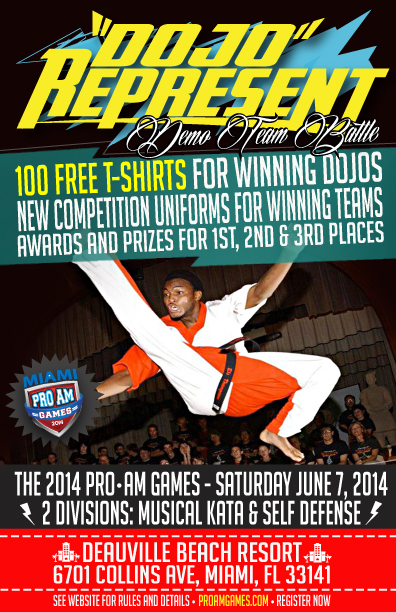 Please mention you are signing up for the Miami Pro-Am World Finals and the battle format(s) you wish to compete in. Parties, Workshops and Battles with Master Mind Rockers & DJ Solo 138 (TBB). 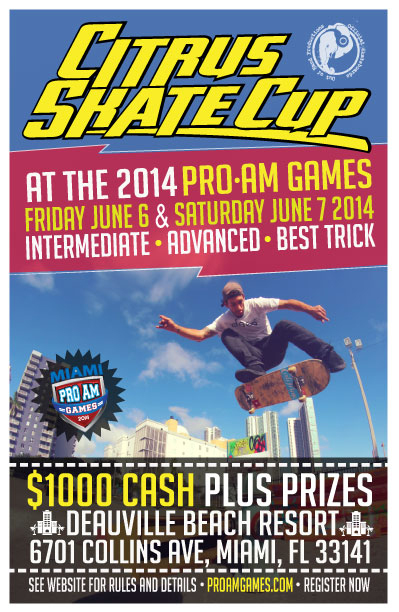 Competitors will get three passes to perform a series of consecutive hand techniques followed by a trick. Each pass will be dictated by a different trick. Winners of each division will perform in the night show main event. Awards & Prizes for 1st, 2nd and 3rd places. 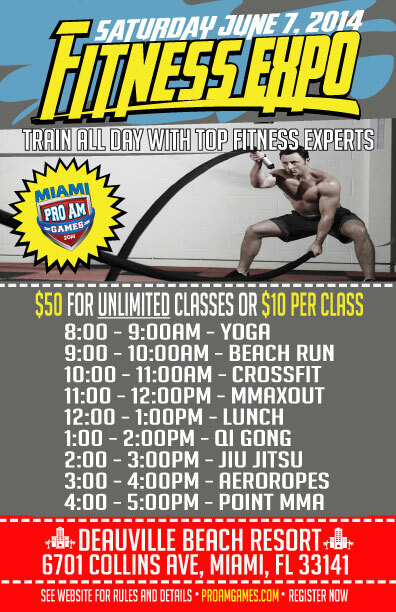 The Krazy Martial Athletic Challenge is a cardio-intense calisthenics competition broken down into 1 minute long activity intervals. Each competitor accumulates points for each rep they do in each activity. The competitor that reaches the highest point total wins!!! 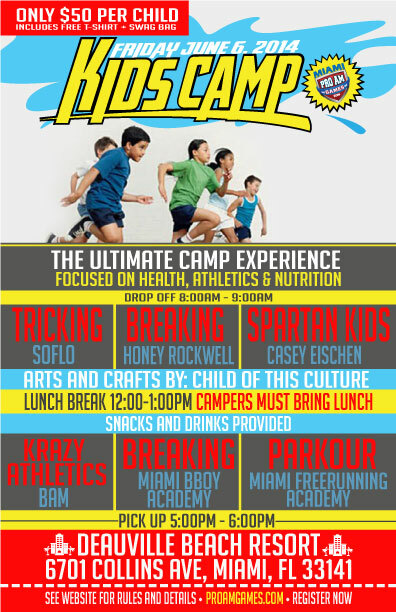 Activities may include: burpees, pushups, jumping jacks, squat kicks, cannonballs, and many more. For example, if you do 50 pushups, 37 burpees, 40 moutain climbers and 52 squat kicks, then your score would be 179 points. All reps are scored and closely monitored by official referees to ensure fair competition. Winners of each division are part of the night show main event. Judges: Rob Menorek, Bryan Delatorre, M.Rodriguez, more TBA. 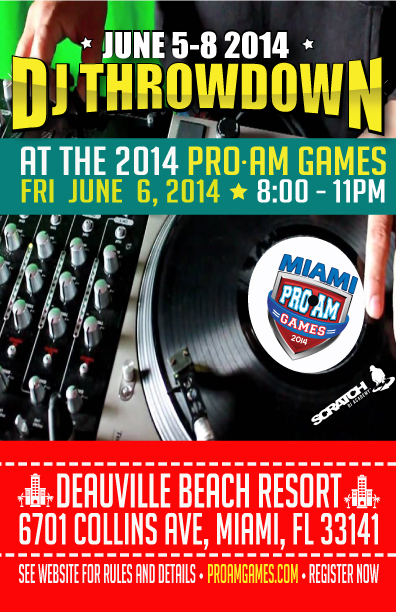 DJ Battle Qualifying, Eliminations & Finals will all be held Friday June 6 between 8-11pm. Finals – 1st round – DJ’s are paired up to battle 3 min head to head round. Championship Round – The two finalists to battle in a 3 minute head to head final round. Top 2 or 4 will advance to night show main event. 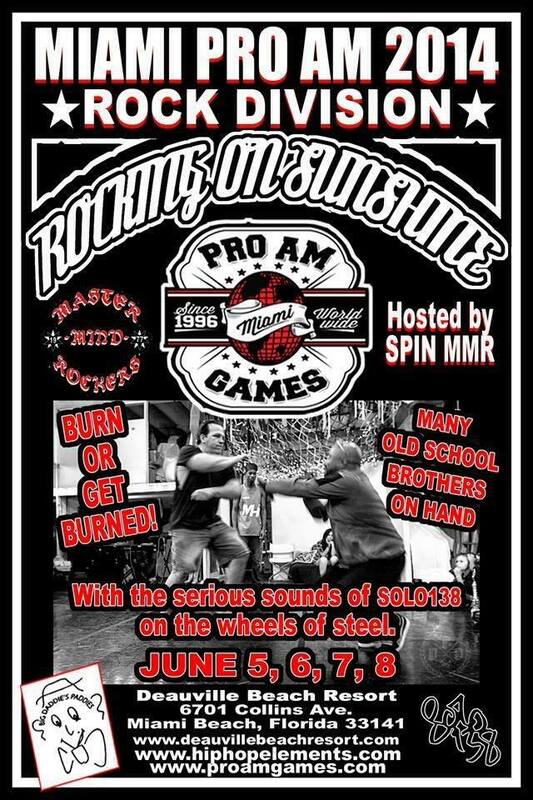 The Miami Pro-Am Kick Off Show will be held at HandCrafted Gallery in the famous Wynwood Art District on May 31st and the pieces will be displayed at the Pro-Am Games event the week after, June 5-8. 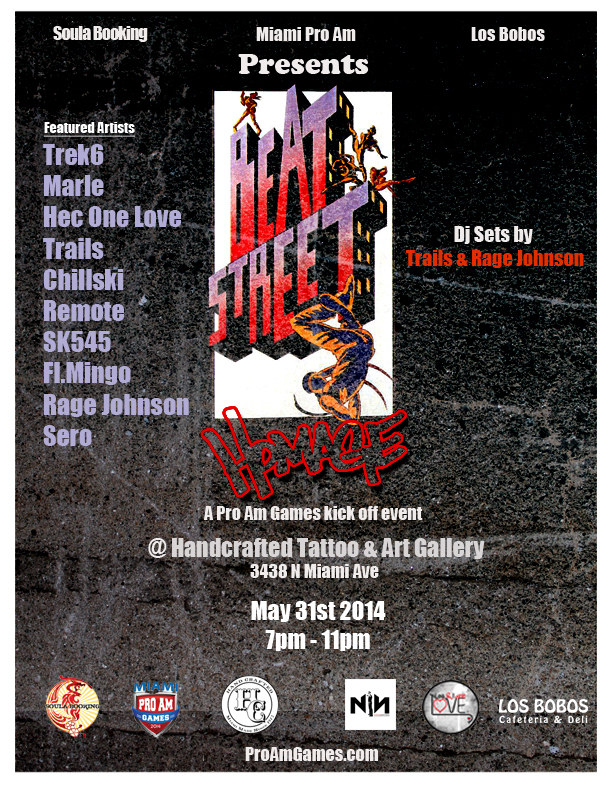 The theme is the 30th Anniversary of the legendary Beat Street Film. 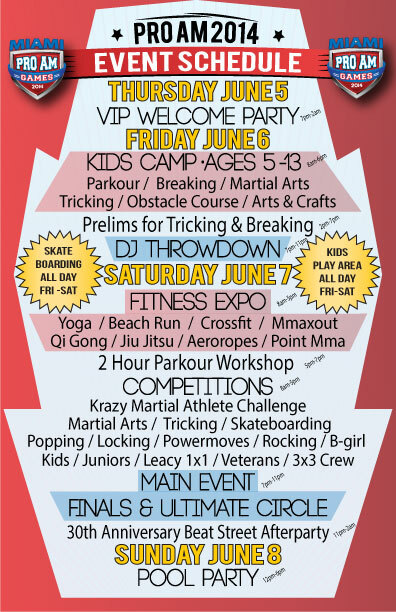 Witness the best dancers and athletes in the world, dozens of exhibition booths, legendary DJs, musicians and family fun for everyone! 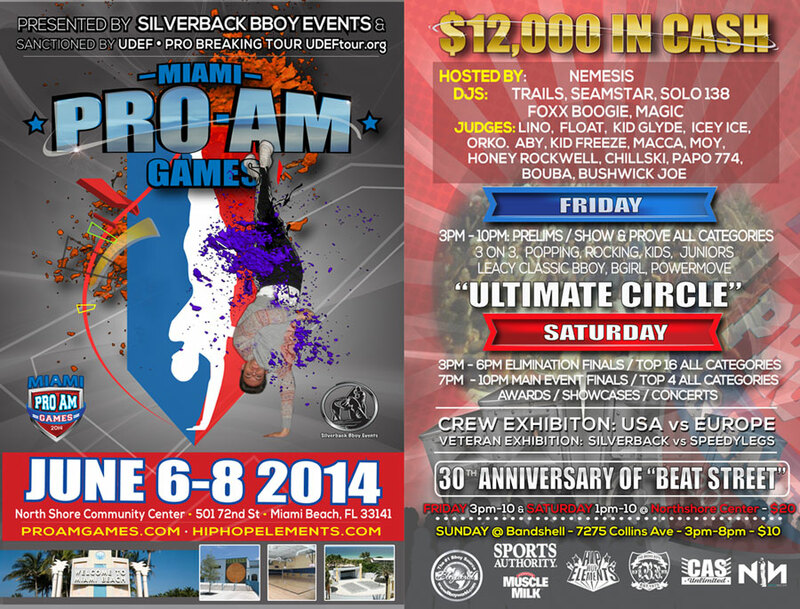 Videos from the Miami ProAm EUROPEAN QUALIFIER held in France @ the World of Street Dance Festival in October of 2013. 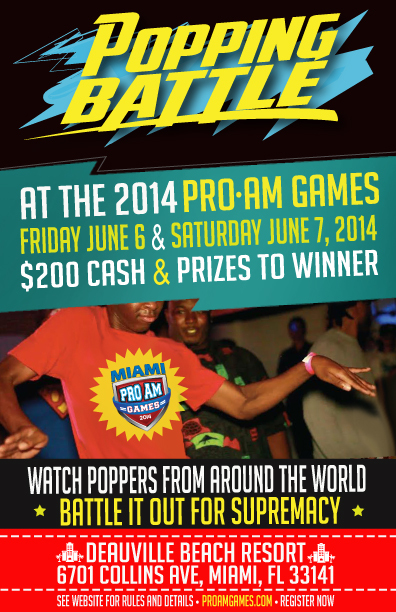 The winning 3 on 3 crew will be flown out to battle in the Miami Finals in June of 2014. 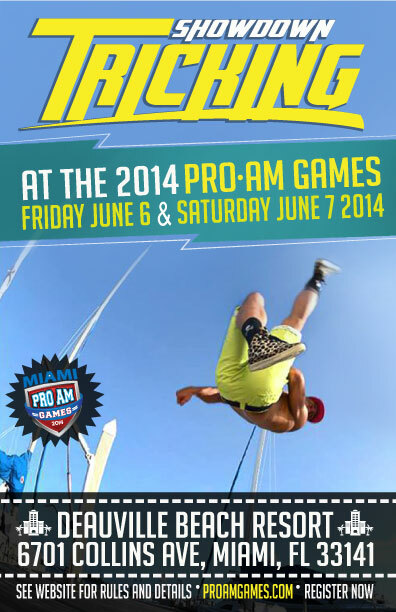 I have a friend who would like to receive further information on the 18th ProAM Games June 5-8 2014. 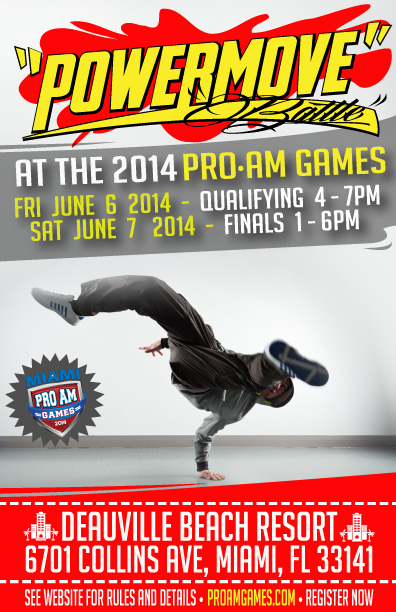 He is a b-boy from Brazil and he is interested in competing in the Old School category. PS: He has not been part of any qualifier. Will he be able to participate anyway? I was in the 3rd B-boy master in 98, trying see about participation information and Vending information? Send to mrbe@mb3gee.com…. Hope to see yal soon……..
Leave a Reply to Dj Mad Butcher Click here to cancel reply.